Every country has a highlight – that one thing that puts it on the map. 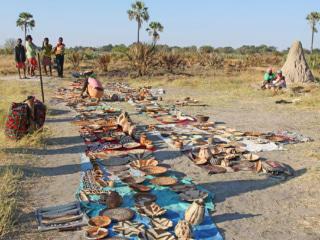 Botswana is different. 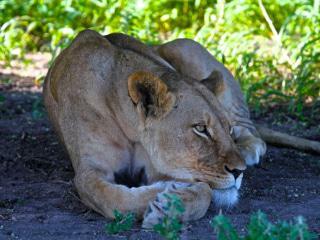 It offers several of the most sought after and totally wild experiences on the planet. This self-drive guided tour takes you through four regions and three countries giving four unique experiences with diverse and fascinating landscapes. You’ll stay in the finest camps, lodges and a house boat, traveling in your own private luxury 4×4 safari vehicle, with an experienced two-member guide team accompanying you in a support vehicle. 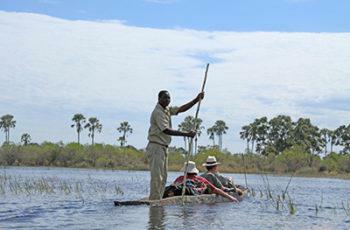 The journey takes you to the Okavango Delta, listed as the 1000th UNESCO World Heritage Site, through Moremi Game Reserve with prolific game viewing and exhilarating terrain, then north to the Savuti Channel with geological roots tracing back 100 million years. 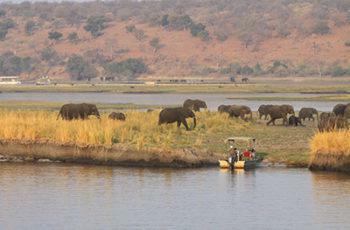 In Chobe National Park you’ll explore the land where elephants rule, and the confluence of the Zambezi and Chobe Rivers, where four countries meet and the greater Zambezi thunders down Victoria Falls. Contact us today for the next available scheduled departure. Stay in remote, luxury camps with uniquely beautiful settings. 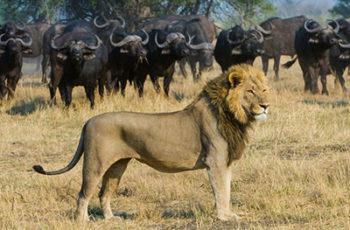 Seek out wildlife on guided game drives. 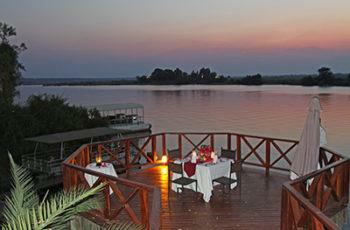 House boat experience on the Chobe River. Hands on photography experience thrown in for free. 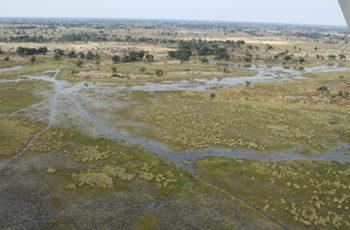 Experience first-hand the Okavango Delta, listed as the 1000th UNESCO World Heritage Site. This trip culminates with a flight over the same route that you have just travelled, giving a unique dimension to your adventure. 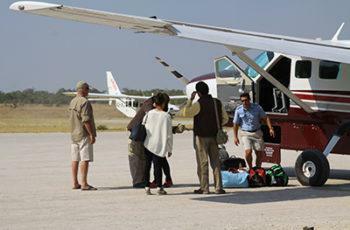 Arrive at Maun International Airport where you will be met by your guide team and transferred to your camp. Your luxury safari vehicles will be presented and handed over for a short shop for personal provisions. An early evening welcome dinner and restful sleep set the tone for wonderful experiences and camaraderie. There is no better way to experience the Okavango than to gently navigate the shallow and crystal-clear waterways of the Delta in a Mokoro (traditional dug-out canoe), and camp out on its remote islands. Imagine gliding through narrow channels made by the animals that habituate this oasis on waters that mirror the sky above. 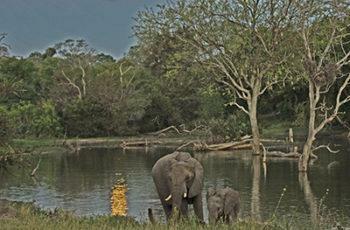 Overnight in a remote and intimate mobile safari camp. Dine on healthy meals made over an open fire and bathe naturally under buckets of water warmed by the cooking fires. 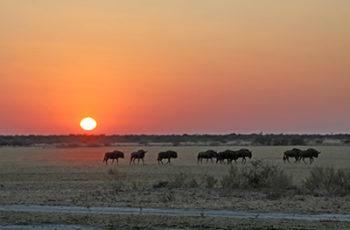 Rise early and discover, on foot, this magnificent inland delta that starts life far away in another land, flowing 1200 kilometres from the highlands of Angola in approximately one month. The waters then spread over the 250×150-kilometre area of the delta over the next four months (March to June). 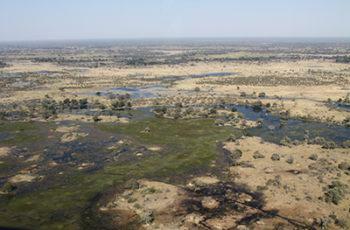 The flood peaks between June and August, during Botswana’s dry winter months, when the delta swells to three times its permanent size, attracting animals from kilometres around and creating one of Africa’s greatest concentrations of wildlife. 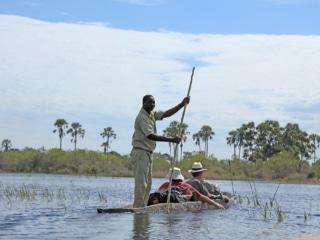 Mokoro back to land and get acquainted with your private safari vehicle. Like pioneers of old, we head out in our safari vehicles to conquer the Moremi and beyond, in search of the Mosi-oa-Tunya – “the smoke that thunders” or Victoria Falls. 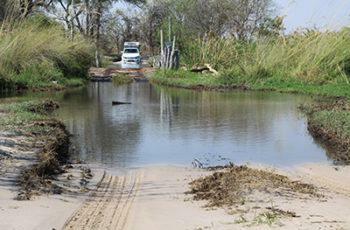 Moremi’s poor roads – some of the bumpiest, sandiest and most waterlogged in Botswana – are unavoidable, but they should never deter anyone from having one of the best wildlife experiences in the world. Camp wild under the stars. 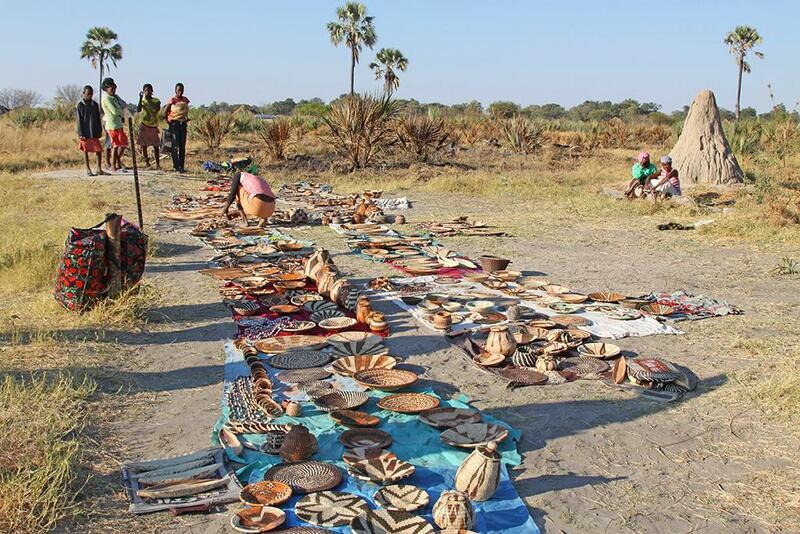 We spend the whole day discovering the 3900 sq km Moremi Game Reserve, named after Chief Moremi III, grandfather of Tawana Moremi, the current heir to the Botswana Chieftaincy. 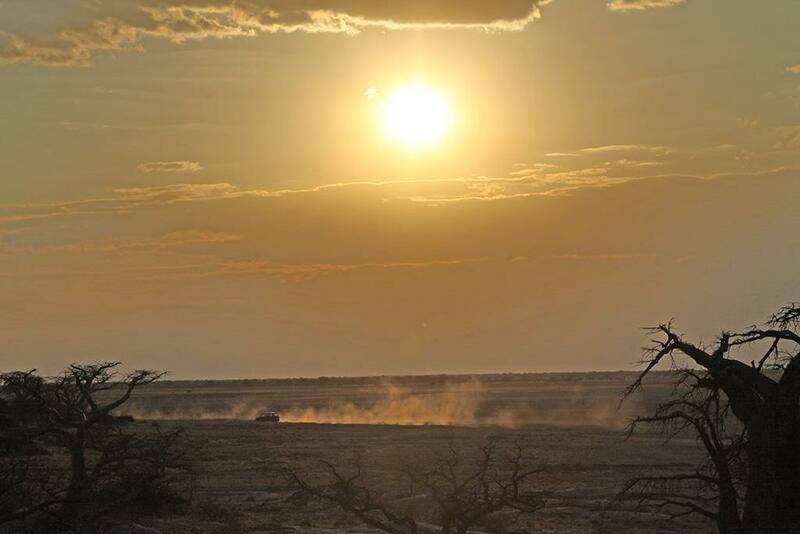 There will be quiet moments of tranquillity, as well as a number of challenges due to the rising water, and a chance to learn and hone 4×4 skills for the great African safari adventure still in its infancy. After a big day exploring Moremi, it’s a late start and a slap up safari brunch before we set off leisurely for one of the private lodges in the area. 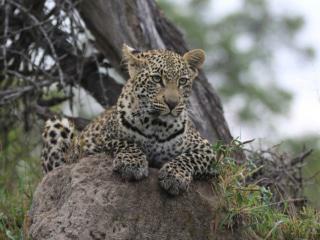 Here we take lazy showers, a siesta or indulge in a good book before going on a game drive with an expert guide – a chance to get a more intimate understanding of the local wildlife. Dinner is served by attentive hosts and stories are relived and shared before drifting off into well-deserved recharge. 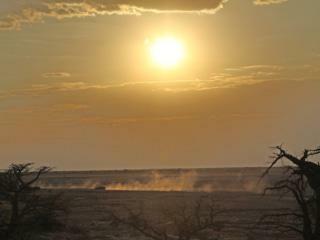 The Savuti Channel is well known for its abundant plains game and one would imagine that this has been this way since the beginning of time. And yet, invisibly, large tectonic plates linked to the Great Rift Valley system, thousands of kilometres away, are steadily changing the landscape. Due to the predominately flat topography, the most minuscule tectonic movement can change the course of rivers and their channels. 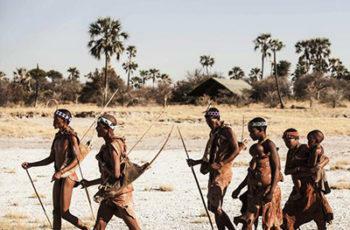 We camp wild in the ever-moving, gloriously rich tapestry that is the Savuti Basin. The Gubatsa Hills, as Savuti’s seven hills are known, dominate the landscape for hundreds of kilometres. The hills were home to the San hunter gatherers 2000 years ago as they lived in harmony with the wildlife. 4000 years ago the Gubatsa were a range of islands buffeted by a Savuti sea that was part of the Makgadikgadi mega-lake system that stretched across most of northern Botswana. A time to contemplate our vulnerability against such history and yet, marvel in the understanding that this is still untouched 100 million years later. We spend one more night in our temporary camp Savuti, with our feet on that very same soil. We continue our safari eastward towards the Chobe River, where we will encounter the largest elephant population on the continent – generally peaceful and tolerant animals, particularly the old bulls. They are Kalahari elephants, the largest in size of all elephant populations. Tonight we camp and rest peacefully among the elephant and re-adjust to our new surroundings and the sounds of the Chobe at night. Prepare yourself for luxury afloat, as we climb aboard specially-prepared photographic tender boats with cameras supplied, and head up the Chobe River to join our floating home. Here we will come up close and personal with every variety of bird, mammal and amphibian one can imagine: a giant kingfisher two metres from the end of your camera lens, a madala elephant (‘old man’) swimming past, trunk in the air like a snorkel. Experience gorgeous river sunsets for two nights in a house boat. 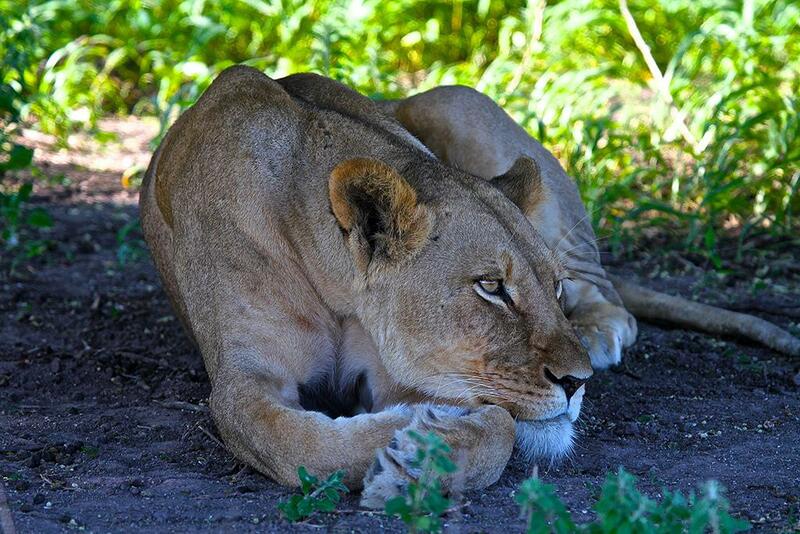 Spend the day floating up and down the Chobe River with hippo, buffalo, giraffe, roan and sable antelope, kudu, waterbuck, bushbuck, impala, puku, crocodiles as well as predators – lion, leopard and hyena. All captured on film and to take away with your complimentary memory disk for prosperity. Have a siesta before sun-downers, and enjoy a scrumptious dinner at the ‘captains’ table. Sweet dreams to the water lullaby. Rise early for one last boat game cruise, or linger longer in bed for a relaxing start to the day. 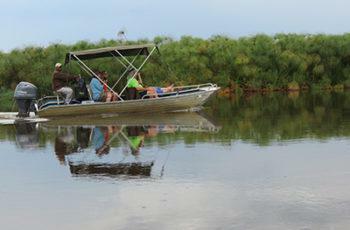 Say goodbye to Captain Ron and his crew after brunch as we transfer to a land-based lodge to re-cover our bush legs. We also say goodbye to our faithful safari vehicle and prepare to fly as we near the end of our safari adventure. 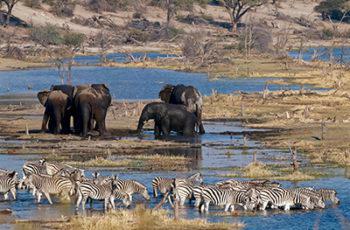 We dine alongside elephant and other interesting animals overlooking an intimate water hole. As the sun rises, we transfer to Victoria Falls in Livingstone, Zambia for the day. Here we discover what is classified as the largest waterfall in the world, based on its combined width of 1,708 metres (5,604 feet) and height of 108 metres (354 feet), resulting in the world’s largest sheet of falling water. David Livingstone, the Scottish missionary and explorer, is believed to have been the first European to view the falls, which he named after Queen Victoria on 16 November 1855, from what is now known as Livingstone Island. Victoria Falls is roughly twice the height of North America’s Niagara Falls and well over twice the width of Horseshoe Falls. 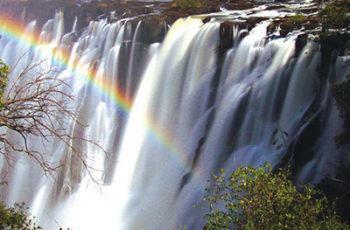 In height and width, Victoria Falls is rivalled only by Argentina and Brazil’s Iguazu Falls. 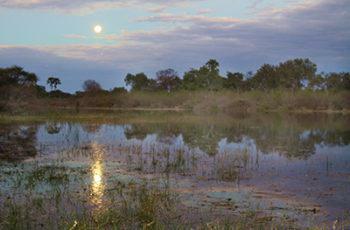 Overnight back at the lodge in Botswana. An early start as we transfer to Kasane Airport from where we take a scenic flight which will cover most of your two week journey, giving you a completely different perspective and understanding of your great adventure. 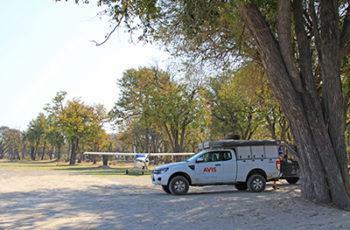 We fly into a lodge deep in the Okavango Delta for two nights. Rise early for a balloon ride over the delta and various activities of your choice or day of leisure. After one last breakfast and an opportunity to say fond farewell, you fly to Maun International Airport and we wish you a safe journey home.